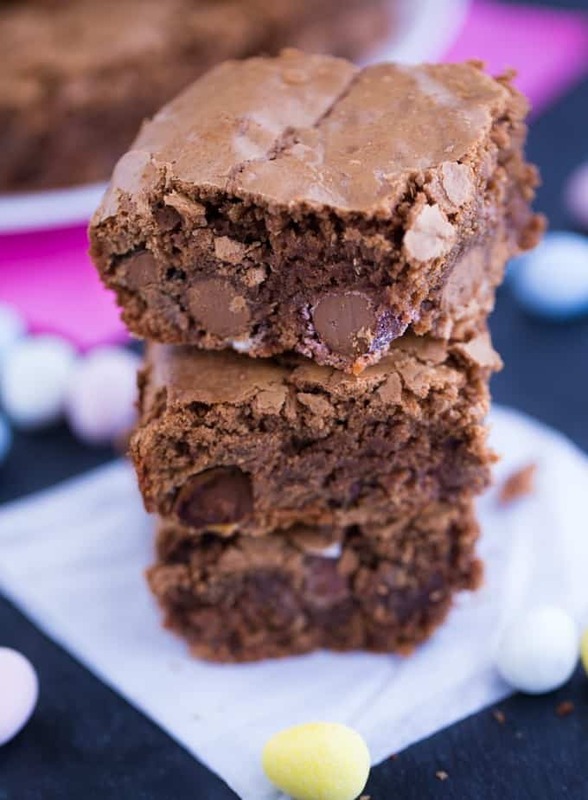 This recipe is the first of two Easter brownie hacks coming up! 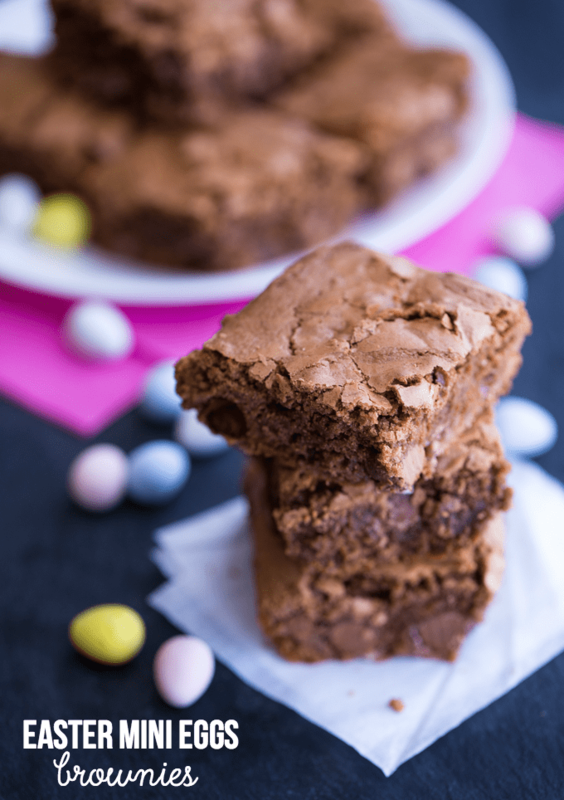 All you’ll need is your favourite brownie recipe, boxed mix is fine, and a bag of Easter Mini Eggs. I made my brownies from scratch so feel free to use this recipe if you like. It’s rich, chewy and always a hit! The stores are full of scrumptious Easter candy and I stocked up on a bunch. Both Hershey’s and Cadbury’s makes mini eggs. I think even Walmart has a generic store brand too, but I’ve never tried them. They are little bites of candy-coated chocolate heaven. You can never stop at just one. At least, I can’t! Prepare your brownies as you normally would. Then, before putting them into the oven, mix in a cup of mini eggs. 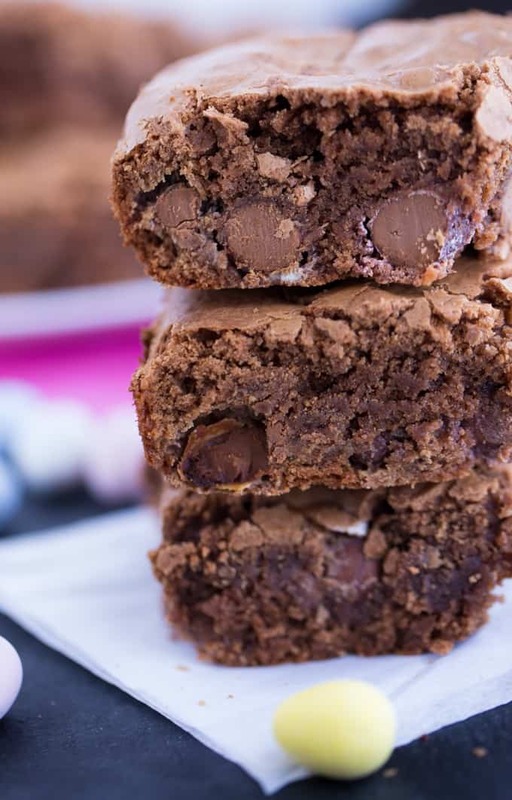 When you cut them into squares, you’ll see the little chocolate chunks spread throughout. I doubt they sell mini eggs year round, at least I haven’t noticed in my area, so grab a bunch of bags to satisfy your chocolate cravings long after Easter ends. It’s early this year and coming up fast! Check out my Easter board and Easter Desserts board on Pinterest for more fun ideas to celebrate the holiday. And keep an eye out for my next Easter dessert recipe. Trust me, it’s one you WON’T want to miss! Do you like to add anything special to your brownies? Add a little Easter fun to your next batch of brownies! This recipe is always a hit with my family. Preheat oven to 350F. Grease a 9 inch square baking pan. Melt the butter and chocolate chunks in a small saucepan on low heat. Stir constantly until melted. Remove from heat and cool for 5 minutes. In a large mixing bowl, beat sugar, vanilla and eggs on medium high speed for 4 minutes. Pour in chocolate and beat on low until combined. Beat in flour on low speed until blended. Stir in Mini Eggs. Spread brownie mixture into baking pan. Bake for 40 minutes. Remove from oven and cool on a wire rack for a couple hours. Cut into squares and serve. Yum! 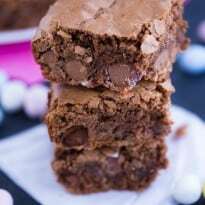 I have Reese’s Mini Eggs, thinking this recipe would be good with them too! this recipe could be trouble for me…..instantly hooked! These are easy to make and fun for an Easter dessert. They look so delicious. I love all your recipes that you share! Fantastic recipe look forward to making this. Got to get some chocolate mini eggs. These brownies look yummy! I plan on trying the recipe! NO brownie has ever done me wrong, these look like they wouldn’t disappoint either. I love brownies so good, even better with added chocolate, yumm!!! Uh, oh. Chocolate in chocolate. How can I resist? My mouth is watering just looking at these pics! I can’t eat chocolate, BUT I can make this for the boys. These look delicious!!! Happy Easter! I love these mini eggs! I bet they taste great in the brownies! Thanks for linking up for Friday Favorites. I’m featuring you this week!